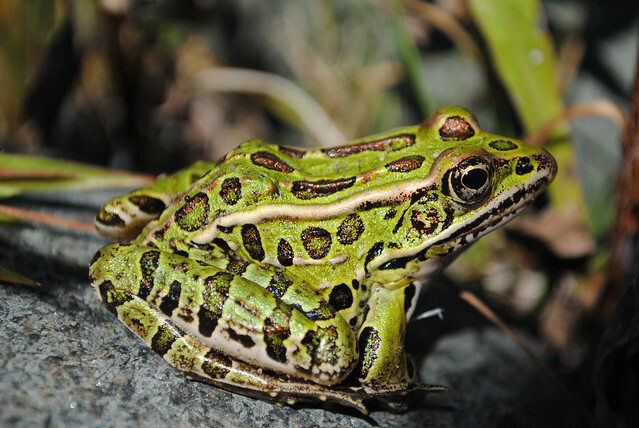 Northern Leopard Frogs (Lithobates pipiens, formerly known as Rana pipiens) are one of the listed endangered species in the world found mostly in United States as well as in several parts of Canada. They are green colored with uneven skin over the body. These True frog family leopards are highly populous and one of the loving pets in States of America. In an average the leopard frogs grow approximately 11 cm in size. Not to be surprised that the female frogs grows larger than the males. The lovely looking species became popularly known as ‘Leopard Frog’ since they are having dark rosettes and spots with uneven form all over their legs, body along with its back. Several creamy stripes are seen on their backs. Leopard Frog got a pair of webbed back legs that has made them as amphibians. These small animals prefer to live in the wet places like brooks, pools, wet pasture or marshland. Being a carnivorous group of animals they are usually in the habit of taking different kinds of insects and small creatures like crickets, small fish or frog, worms, and rats. They can even swallow the animals and birds about their own size with the help of their large sized mouth. The Hawks, Herons, Skunks, Bullfrogs and Snakes kill and eat these leopard frogs. As natural phenomenons of leopard frogs are adapted that helps them for their survival in their environment. The weeded back legs provide them a good speed by covering more than two meters in every jump. They are habituated to run in a crisscross manner that enables these animals to save themselves from there predators to catch them. In the similar way they can jump on their prey from beyond a long distant place. Their body color of dark green and brown facilitates them to hide and stay in disguise form their hunters. They can make a very shrill sound helping to puzzle the captor and get themselves free. The Leopard Frogs have a tremendous popularity among the people of Unites States to keep as a very attractive pet. As the Leopard frogs are habituated live in reasonably in a bigger space area so providing a specious place is the primary issue. A reservoir around ten gallon can provide them a comfortable movement. The half portion of the container is to be filled with water while the other half with soil. It is essential to use only chlorine-free water for keeping these frogs. The water is to be changed in an interval of a fortnight. They need an average temperature of 20C throughout the day. The creature should feed with small insects like flies, crickets, worms or flies etc. They like to take different fruits or vegetables occasionally. It is important for an individual for washing the hands properly after handling these creatures. The Author is a plumber mill hill in London and also writes about various London refurbishment tips and advice for plumbing repairs.